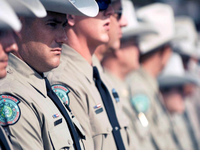 Since the first Texas Game Wardens were commissioned in 1895 to patrol for oyster violations on Galveston Island, to the present day number of 551 patrolling the vast State of Texas, service as diverse as this great State has been the core mission of this highly trained, deeply committed group of State Law Enforcement professionals. 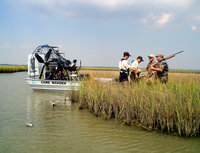 Water Safety enforcement on Texas waters both freshwater lakes and rivers, and the saltwater bays and estuaries nine nautical miles out into the Gulf of Mexico, is also a critical task for wardens. Each warden is commissioned as a marine safety enforcement officer and receives extensive training in boat operations. The ultimate and dearest price was paid by two game wardens responding to the devastating Galveston hurricane of 1919, as was the case in 2007 when game warden Ty Patterson lost his life attempting to recover a drowning victim during the Paluxy River flood. Wardens also responded as a police force and search and rescue force during Hurricane Katrina in Louisiana, as well as responding during natural disasters, whenever and wherever they occur in the Lone Star State. 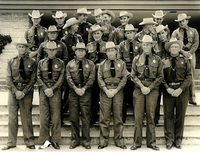 Community based law enforcement was being performed by game wardens long before the term was defined. Game wardens reach out and mentor youth in outdoor related activities such as hunting and fishing, and teach hunter and boater safety and give countless hours toward educating all on the importance of wildlife stewardship, as a primary and fundamental duty of the job. Before and after the events of 911 changed the security of the country, game wardens work to secure the remote border with Mexico by deterring illegal entry, and enforcing human trafficking laws, narcotics laws and wildlife resource regulations. For over 100 years, Texas Game Wardens have exemplified dedication, passion, and commitment to protecting the natural resources of Texas. This is our tradition of service.